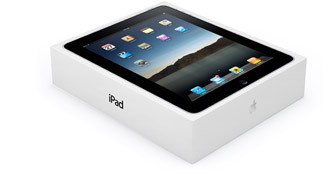 The Apple iPad WiFi Model will not accept a SIM Card but can be used as a wireless device. The Safari web browser on iPad puts the Internet in your hands — literally. View whole web pages in portrait or landscape on the large Multi-Touch screen with vibrant color and sharp text at a size that’s actually readable. When you rotate iPad to landscape, the page you’re viewing rotates, too, then expands to fit the display. With iPad, navigating the web has never been easier or more intuitive, because you use the most natural pointing device there is: your finger. Scroll through a page just by flicking up or down on the screen. Double-tap a section on a page to enlarge or shrink it. Or pinch to zoom in or out. When you touch and hold a link, Safari shows you the URL so you know before you go. There’s also a handy thumbnail view that shows all your open pages in a grid, so you can quickly move from one page to the next. 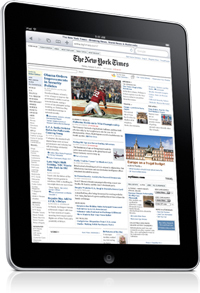 Safari takes full advantage of the powerful technology built into iPad. It connects to the web via high-speed 802.11n Wi-Fi. Because Safari supports the latest web video and audio innovations in HTML5, you can enjoy the rich multimedia experience you expect from the Internet. Safari plays compatible video right in the page, or you can double-tap a video to play it full screen. iPad is the best way to experience the web. View whole pages in portrait or landscape on the large Multi-Touch screen. And let your fingers do the surfing. There’s nothing like the Mail app on iPad. With a split-screen view and expansive onscreen keyboard, it lets you see and touch your email in ways you never could before. 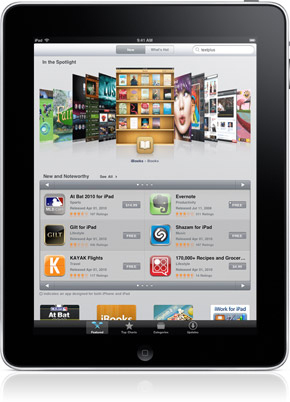 It’s easy to search for nearby restaurants or landmarks on iPad. But what if you don’t know the name of the place you’re looking for? Say you’re in a new neighborhood and you want to find a restaurant. Type “restaurants” in the search field. All the closest restaurants will appear as pins around your location. Tap a pin to see a restaurant’s name. Touch and hold to see it in street view so you’ll recognize it. Maps even gives you directions and a route from where you are. Right now you can tap into the App Store to shop for over a thousand amazing apps made just for iPad — and more are added every day. They’re easy to find in their own special section, in every possible category: games, lifestyle, social networking, education, and dozens more. And they’re all designed specifically to make the most of the large iPad display, precise Multi-Touch screen, and powerful processor. If you’re just browsing, the App Store makes it easy. You can see what’s new in Featured, check out the Top 25, and even preview each app. Find apps by doing a quick search, then download them wherever you are and get started right away. Tap into more than 150,000 apps. There are more than 150,000 apps for iPhone and iPod touch on the App Store. 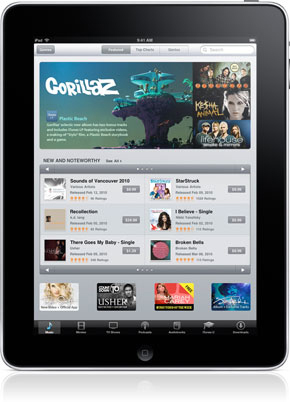 And iPad works with just about all of them — including apps you’ve already downloaded. Get Genius app advice. With thousands of apps in the App Store, you need an easy way to find new ones to love. Enter Genius recommendations for apps. Tap the Genius icon to get recommendations for apps that you might like based on apps you and others have downloaded. It’s easy to be good with Numbers. Who knew making spreadsheets could feel so natural? 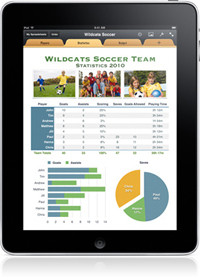 Numbers is the most powerful spreadsheet app designed to work with iPad and Multi-Touch technology. With a few taps, you can create tables and charts, add photos and graphics, and enter and edit data. Numbers isn’t just a spreadsheet application — it’s a flexible canvas. Which means you can add multiple tables and charts anywhere on a sheet and move them wherever you like. And every spreadsheet starts out stunning, thanks to Apple-designed templates. Choose from 16 templates for home, work, and school, then make it your own. See more of your music. The big, beautiful iPad display lets you browse your music collection by song, artist, album, genre, or composer with the touch of a finger. See your music as full-size album art. Flip through all your albums and tap to choose what you want to hear. It’s as natural as flipping through CDs. When you want to play a song, tap it. The Now Playing screen appears, displaying the album art for the song you’re playing. Tap to flip the album over and view the track list. Use your finger to pause, shuffle, change the track, and adjust the volume. Or, if you prefer some private listening, connect wired or Bluetooth wireless headphones, and it’s just you, your favorite tunes, and fantastic sound. Instant music, movie, and TV show gratification. You’re in a coffee shop and you hear a song you just have to have. Or you’re in an airport, wishing you had a good movie to watch. With Wi-Fi access and one tap of the iTunes icon, you can discover new music, movies to buy or rent, TV shows, and podcasts. Then download it all wirelessly, right to your iPad. Wherever you happen to be. Browse New Releases, Top Tens, and Genres. If you know exactly what you’re looking for, type in a quick search. Play a preview of any song or video, then tap to buy it. With millions of songs and thousands of movies, TV episodes, and music videos in the iTunes Store — and a huge selection in HD — you might need some help finding new favorites. Genius keeps track of what you love and recommends more of the same. When you connect iPad to your Mac or PC, the music, movies, TV shows, and videos from iTunes on your computer can sync to your iPad — and the media on your iPad can sync to iTunes on your computer. So entertainment goes with you everywhere. 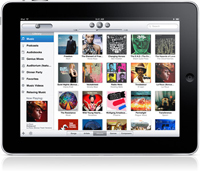 Discover iTunes U on your iPad and download some knowledge. You’ll find lectures, discussions, language lessons, audiobooks, podcasts, and more from top universities, museums, and other cultural institutions around the world. Tap, pinch, and flick through your photos. 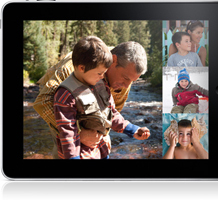 With the built-in Photos app on iPad, you can see and touch your photos in intuitive new ways. Your photo albums appear as tidy little stacks you can pinch to preview. Tap a stack, and the whole album opens up. From there you can scroll through thumbnails. Tap to view full screen. Or flip through photos one at a time. 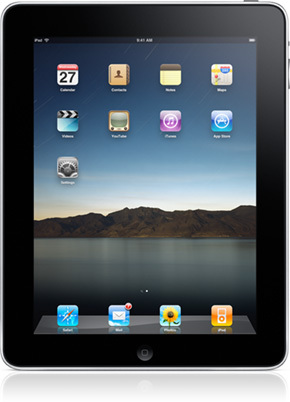 The gorgeous 9.7-inch iPad display shows off your photos in vivid color with excellent brightness and contrast. It uses a premium technology called IPS (in-plane switching) to provide an extremely wide viewing angle, so friends and family can crowd around your iPad and still get a great view. When you rotate iPad, your picture rotates, too, so you can show it off any way you want. Flip iPad over to share a snapshot with the person across from you, then flip it back to share with someone sitting next to you. You can even create and play your own slideshows, complete with music and animated transitions. Place iPad in the optional iPad Dock, turn it on, and enjoy the spectacle from across the room. When you want to share photos from afar, email them or publish them to the web using MobileMe with just a tap or two. You can import photos directly from your camera or its SD card using the optional iPad Camera Connection Kit. And you can save photos from email to your iPad photo library. Your own personal big screen. A beautiful 9.7-inch high-resolution display makes iPad perfect for watching any kind of video: from HD movies and TV shows to podcasts and music videos. Since iPad is essentially one big screen — with no distracting keypad or buttons — you feel completely immersed in whatever you’re watching. 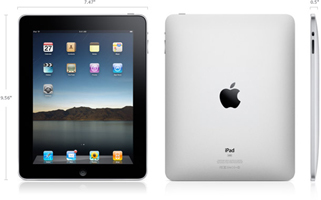 And you can keep watching for up to 10 hours, thanks to the lithium-polymer battery in iPad. Tap the iTunes icon and you’ll find thousands of movies — including HD movies — ready and waiting. Tap and browse around. When you find a movie you like, watch a preview. 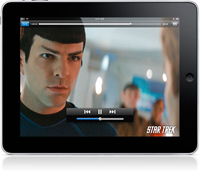 Whatever you buy or rent downloads right to your iPad video library, so you’ll be at the movies in minutes. You can also catch up on your favorite TV shows, watch music videos, and download podcasts. The YouTube app is designed specifically to take advantage of all the capabilities of iPad. The high-resolution screen makes YouTube videos look amazing, especially those in HD. You found a YouTube video so funny, you just have to share it. Email your favorite videos to your favorite people. Tap Share on any YouTube video detail page, and iPad creates an email with the video link already in it. You can even post it to Facebook. 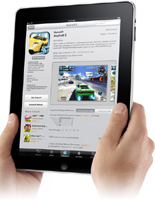 iPad responds to motion using a built-in accelerometer. When you rotate iPhone from portrait to landscape, the accelerometer detects the movement and changes the display accordingly. So you immediately see the entire width of a web page, view a photo in its proper aspect ratio or control a game using only your movements. 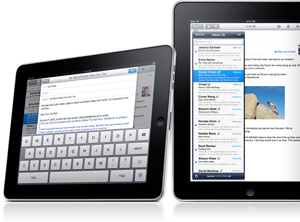 With its large Multi-Touch display and innovative software, iPad lets you control everything using only your fingers. Type using the predictive keyboard, glide through albums with Cover Flow, scroll through photos with a flick or zoom in and out on a section of a web page — all courtesy of Multi-Touch. Use the Notes app to jot down anything and everything and take it with you wherever you go. 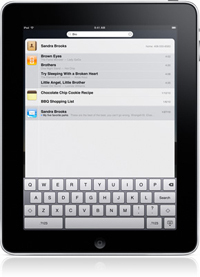 iPad is so thin and light, you can take it to a meeting, a lecture, even the grocery store. 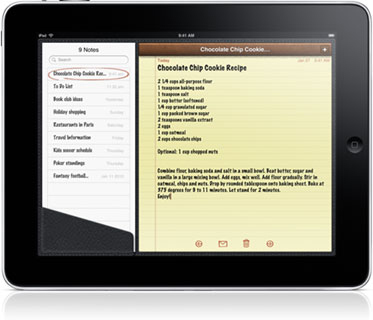 The iPad display gives you plenty of space to fill with your notes and to-do lists. The large onscreen keyboard makes it easy to write notes quickly. Text is crisp, bright, and readable. The iPad keyboard even accelerates your typing by tracking what you write and suggesting words, correcting spelling, and inserting punctuation for you automatically. And iPad apps are made to work together. So if you need to check a phone number in Contacts or find an address in Maps while you write, Notes remembers where you left off. Make a note, then email it to yourself or others. And you can sync your notes to your Mac or PC through iTunes.